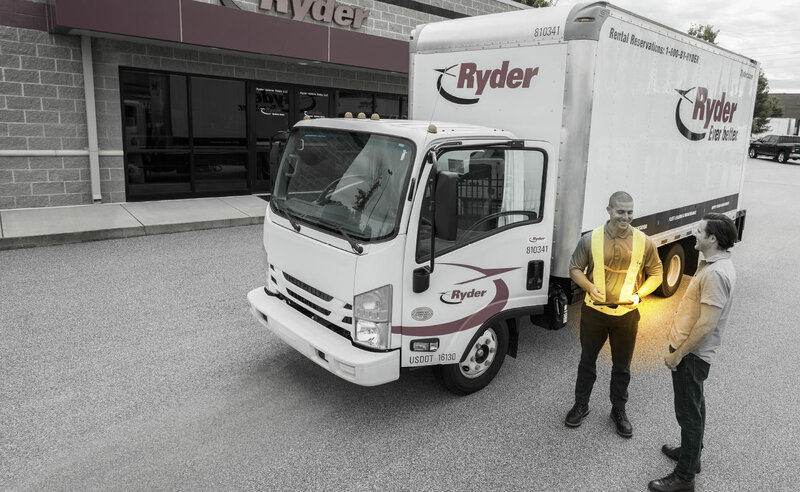 Ryder demonstrates a culture of integrity in all aspects of our business. Our employees adhere to strict Principles of Business Conduct (POBC) that set us apart as a trusted, ethical, and responsible enterprise. Built around our leadership competencies of Character, Judgement, Relationships, and Results, these Principles help ensure that our employees conduct our business fairly, honestly, and ethically. At Ryder, we are committed to human rights and to laws that prohibit child labor and human trafficking. We have developed a Supplier Code of Conduct to complement our Principles of Business Conduct and clarify our expectations in this area. All of our suppliers, vendors, and other entities who do business with us are expected to implement policies and procedures to ensure that they do not engage in or support forced labor or unlawful child labor, and that they comply with all laws and regulations that protect human rights and enforce ethical labor practices. Ryder’s Compliance & Ethics Department, headed by our Chief Compliance Officer (CCO), oversees the framework by which Ryder manages the legal, regulatory, compliance, and ethical challenges of our business. The CCO reports to the Chief Legal Officer and regularly reports to the Company’s Leadership Team, Audit Committee, and Board of Directors on various compliance and ethics initiatives, including our anti-bribery and anti-corruption programs, Helpline statistics, Enterprise Risk Management, and any compliance-related issues or trends that could impact the company. Ryder’s Policy Management System houses our robust set of corporate policies in one location for employees to easily locate and review at any time. Embedded in the system for each policy is a designated policy owner, an indication of when the policy was last updated, and when it would next be reviewed. Our Policy Management System also enables us to easily communicate mandatory policies to employees and track attestations of review. Ryder’s Policy Management System is available via mobile app to ensure accessibility for our field employees and those with limited laptop access, such as drivers and technicians. Currently, the Ryder Policy Management System is available to all U.S. and Canada employees, and we plan to roll out the system to our global employees in 2019. Ryder’s comprehensive Principles of Business Conduct apply to our officers, employees, and Board members and cover all areas of professional conduct. Topics include but are not limited to: mechanisms to report known or suspected wrongdoing; bribery and corruption; compliance with law; safety, health, and the environment; conflicts of interest; gifts and entertainment; social media use; and contributing to a respectful workplace. Available in multiple languages, the POBC forms the playbook that keeps Ryder on the right track so that we can maintain our reputation for ethical conduct. The ethical standards laid out in the POBC are foundational to employee development at Ryder. During—and often before—the new hire onboarding process, we introduce and train all new employees on the POBC and how to report conflicts of interest. We provide online ethics and compliance training to all salaried employees three times per year, and once a year for all hourly employees. Our POBC training covered nearly 100% of employees in 2017 and 2018. In addition, as part of our Speak Up campaign, we provide regular updates to employees regarding real scenarios that were reported to the company and communicate how these issues were resolved. To ensure that we maintain a culture of ethics, we also provide targeted in-person training and webinars that include numerous topics, such as Tone at the Top, reporting on concerns, and ethical leadership. In the event that any of our employees have a compliance or ethics concern, Ryder maintains multiple channels and departments for communicating concerns, as outlined on pages five and six in the POBC, including a Helpline. The Helpline is hosted by a third-party and managed by the Compliance & Ethics department. Reports can be anonymous and the Helpline is available 24/7, in multiple languages to all global employees. The Helpline third-party provider processes and synthesizes complaints, then sends them to Ryder via a case management system. The Compliance & Ethics department reviews all concerns and assigns an investigator based on the nature of the allegations. Various internal departments may be involved in investigating concerns, such as safety and security, internal audit, human resources, legal, and compliance and ethics. Ryder maintains an established protocol for training investigators and setting guidelines on how to conduct an investigation. We take every single concern seriously and investigate 100% of reported concerns. Highlight Story: Helpline Poster distributed to all locations as part of our Speak Up campaign. 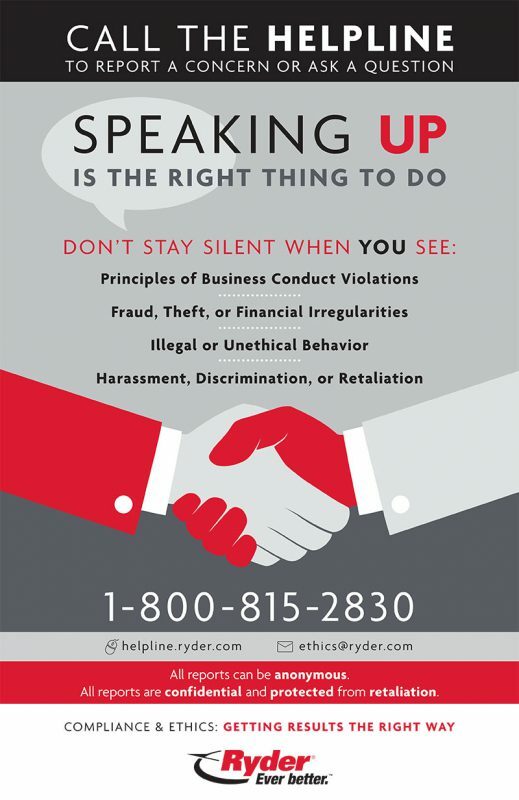 As part of our Speak Up campaign, Ryder distributed Helpline posters to all locations, advertising the resources available to our employees to empower them to speak up if they have a concern.